Money: ugh. For a long time thinking about it was horrible. Other than those first few times I babysat and had the thrill of a cold, hard $3 per hour in my hand (yes, that was my rate, even in the spendy 90's), money has always seemed to me a taboo subject and an anxiety-builder. For a while, every dollar I had was a reminder of the ten dollars I didn't. But some kids love money. They are fascinated by its symbolic value and very real power. Fudge is one such kid. "I'm nice," Fudge said. "and I like to talk about money. You want to know how much I have?" "No," Sheila told him. "It's nobody's business but yours." He told her anyway. I knew he would. "I have fourteen dollars and seventy-four cents. I mise my money every night before I go to sleep." Question for consideration: how does Judy have such a pitch-perfect ear for the way kids talk? I wonder if she is kept in touch with these perfect turns of phrase and attitudes and logic not only from her own kids, but from her fans that are constantly writing to her. Must be. Like the last Fudge book, this one's just for fun. Long lost relatives. Uncle Feather. Discussions of "tightwads." It's a good time all around. 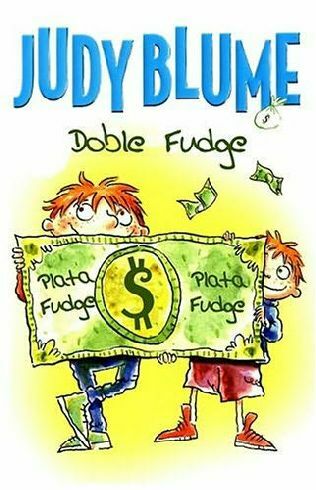 This is the last of the Fudge books-- Judy keeps insisting she won't write any more. But I'd be willing to bet my last dollar otherwise.